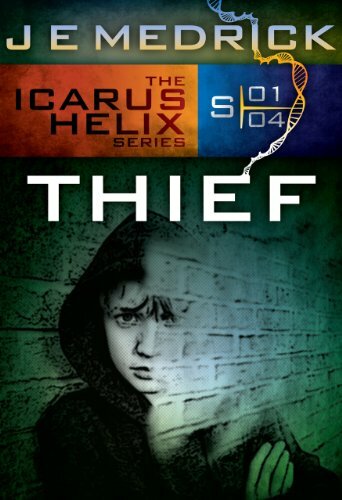 Thief is the fourth book in J.E. Medrick's young adult Icarus Helix series. Single parent household. One friend in the world. Father in jail for double homicide. Poor. Mute. What would YOU do if you suddenly turned invisible? 15-year old Mason is dealing with just these problems. When he uncovers a crippling family secret that he blames on himself, he knows things need to change. He needs them to change. Not just for himself - but for his mother. Each Icarus Helix novella features a new teenager discovering a superpower. I never know how the next book will relate to the previous installment, but I always have the best time finding out. Thief features a mute named Marcus who discovers the power to turn invisible. That would be a terrifying yet awesome power to possess! Maybe it's because I'm rereading The Lord of the Rings right now, but the more I think about it, invisibility is the power I would want. Like the previous installments, Thief was a lot of fun to read. 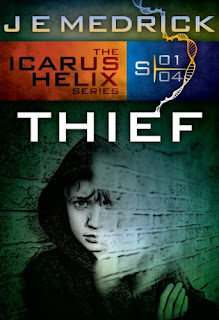 I enjoyed finding out more about the Icarus Helix origins, and as always loved discovering how Thief connected with the other Icarus Helix books. If you haven't checked out the Icarus Helix series yet, check out my reviews for Cheat, Liar, and Coward. This is a great series to follow. My curiosity about this series increases with each review. This seems really cute. I think if I had the power of invisibility, I would get myself in a lot of trouble.